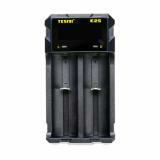 Tesiyi E2S Charger comes with two independent charging slots and several protections. 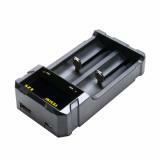 It will bring convenient charging. E2S Charger, which comes with LCD screen backlight to show status of battery, is compatible with several kinds of battery. 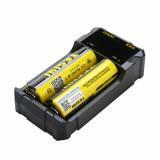 In addition, it has several protections to ensure high performance and two independent charging slots. 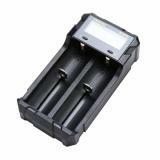 • Quick link: 18650 Li-ion Battery. I bought this charger and the batteries (21700) and have not been impressed. Only have been using 4 days. The charger is fine but makes a buzzing noise. I contacted the company and received a prompt response. They refunded me part of my money and said that it’s safe to use. Still makes me nervous. 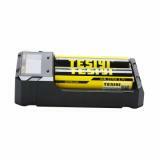 The batteries have disappeared from Amazon so I’m reviewing them here. They do not keep a charge-in 2 hours the batteries are half drained. I use them in my mod and I’m not a heavy vapor. I feel like I have to constantly charge. I would not purchase again. 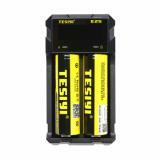 Tesiyi E2S Charger with a DC5V 2A input; Shell meterial: ABS; Feature: Screen and USB Output; Color: Black; Applicable to 21700/20700/18650 battery.